First, on behalf of all of the coaches, I want to thank ALL of you for a wonderful year. It has been so incredible to watch you progress from 1 minute of running to 11+ miles. We are so proud of what you have accomplished, and we are so impressed with the bond you have created. We have enjoyed teaching you and learning from you and we can’t wait to run with you side-by-side in the days ahead. For those of you in Nice, thank you for your hilarious song and moving tribute. Jodi – I heard several people say that any future beginner groups were in big trouble trying to follow in your footsteps. You guys made our race experience so special. I know not everyone had a great race, but I know we all had a great time being together and meeting new friends as well. You are an amazing group of women that we are so honored to have coached. You don’t need to have run the race to now be an ex-beginner. You have all done the training and you are all ready to move up to the big leagues – the scary MWF group. Hopefully you all received Jane’s email this morning with the routes for the week. Tomorrow’s run is an easy 4 miles to Whole Foods in Kensington. It’s just running down to Hyde Park, across, and through to Kensington High Street. We passed the Whole Foods on the way to Kew – easy peasy. And we won’t be pushing any pace tomorrow. Most of us coaches will be there tomorrow and we will be happy to guide you to others who run a similar pace, or run with you, or whatever! You can also come and run with each other. This run is just about getting back out there, saying hi, and getting some shopping done. Friday, I am happy to run with whoever wants to up the hill. It looks scary, it’s not super fun going up, but you get there and you’re psyched! And then you get to go into the beautiful Heath. So please come out. I know we are planning an outing to see Jodi speak on 8 May (she is also speaking on 29 May and 5 June if you can’t go 8 May). And Swati and Vijaya still have their big race to come, also on 8 May. But for now, you guys are officially DONE as beginners. We love you all and are so excited to see you out with everyone else. Beginners Week 33: 17 April 2016 THIS IS IT! Tuesday – do your normal 60 minute run but don’t push it. Thursday we will just do 45 minutes around Regent’s Park at a slow pace. The goal this week is to enjoy your running (!!) and your group. Relax! If you push the pace this week, it may make your legs feel a bit heavier than normal on Sunday from the muscle damage that comes when you are building up muscle (you may have noticed this on your weekend runs after a long Thursday run). Your training is done, you are READY! As Paula said in the final email my beginner year, this week is about finding the joy in running and in your amazing group. After the run on Thursday, we coaches will hang at Starbucks so you can ask any questions. And feel free to email any of us this week if there is something on your mind. Try to get a good night’s sleep on FRIDAY. Getting good rest at least one of the two nights before the race is important so get yourself to bed at a decent hour on Friday. This week, try to eat well. What you eat the week before is more important than the night before. Keep your protein intake fairly high, don’t drink too much alcohol, drink water slowly but consistently. On Saturday and Sunday nights, the beginners will all sit together (with your coaches) at dinner, so we will have plenty of time to answer last minute questions on Saturday and then CELEBRATE TOGETHER on Sunday. Yay! On race morning, we will group you with your assigned coach(es) similarly to what we’ve been doing the last few Thursdays. We will all go to the start line together and we will start off together but you should stay with your assigned coach until she says it’s OK to go ahead. From what I can tell, there are about 4,200 half marathon runners and about 2,500 10K runners, all starting out together. This is not huge but it will seem crowded. Also as Jane noted, try to take time to ENJOY the race. Look around at the scenery, the other runners, the spectators. Think how far you have come since running for 1 minute in September – you are all INCREDIBLE! For the first week after the race, don’t worry about getting right out there to run. You may or may not feel sore from the race – a lot of it will depend on the weather and how hard you push at the end. My beginner year, my group got together the Thursday after the race and did 3 – 4 miles in Regents Park, just to get out there and to reconnect with each other post-race. Also, for those of you willing to brave Fitzjohn’s and the Heath, we are happy to run with you next Friday or the Friday after to give you a few tips on running up the hill. It’s hard, but it’s such a great feeling to get to the top. Plus, the Heath is beautiful (and hopefully Tiffany can meet us since we’ll be running towards her!). I know it can be tricky to start running on MWF after you’ve gotten into such a TTH schedule for the year. It can also be intimidating to run with all those super scary advanced MWF runners. But trust me, ALL of you are running at paces that EASILY fit within the larger MWF group. Your coaches will help connect you with the women in your pace group and I swear, they are all really nice. And you will meet many of them this weekend. So please please come out and run with us whenever you can. It will also make it easier for the fall if you meet some of your fellow pace group runners over the next month or so before school gets out. Well, this is it! Our last big run before the race! You may be a bit nervous about the run, and that is normal. You all can do this – and we know you know you can do it. It’s a long run, and it will feel long, and that’s OK. We will make sure you are not running too fast and we will get there and it will be AWESOME! Use this run to try out what you might wear in Nice – your shirt, waist pouch, hat, leggings, socks. If the weather isn’t cooperative, it’s OK to wear different bottoms (I don’t want anyone catching cold by wearing something too light if the weather is bad), but it would be good to wear your expected shirt so you make sure it doesn’t chafe. We want no surprises on race day that something that worked for a 6 mile run suddenly starts chafing at 9 miles. Right now, the weather looks to be a high of about 70 and a low in the mid 50s. With the race at 9:30 am, the temp will probably be around 60 to start and mid-60s to end. If it’s sunny, it will feel warmer. A note about bathrooms along the run – around mile 5, there is a Costa Coffee attached to the Hilton Hotel on the Kensington High Street (just past the intersection with Holland Road) which has a few toilets. There is also a Starbucks at mile 5.7 but it only has a single toilet. We are not going to plan a stop – it’s better to keep running – but if you need to stop, a coach will wait for you and other coaches will continue on with the group. Please confirm that you will be there on Thursday so we can plan our coaching groups. Finally – I think a few of you may not yet have turned in your medical form. Please please get that done ASAP. One of our runners had a cousin who flew to Italy from the US for a race and was turned away because his medical form wasn’t in order. We don’t want that to happen to any of you!! Please let us know if you need any help with that. We start out the normal way running to Hyde Park. Once in the park, we’ll turn to the left and run down the main walkway as we regularly do, to Hyde Park Corner. At the end of the walk, turn right to follow the main cross route in the park—beware of the bike lane! When this ends at West Carriage Drive, cross the road at the crossing and continue on the pathway towards the southwest corner of Kensington Gardens. We’ll run out of the park at the Broadwalk, turning right onto Kensington High Street and continue for about two miles until we reach the Hammersmith Tube gyratory. 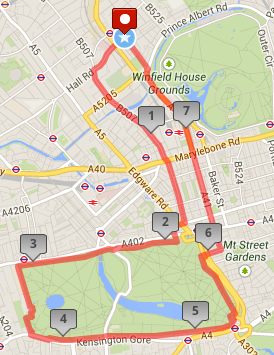 Run counter clockwise towards the left, ending up on Queen Caroline Street which gets you to St. Paul’s Church green. Run along the green to the right, heading to and crossing over Hammersmith Bridge. 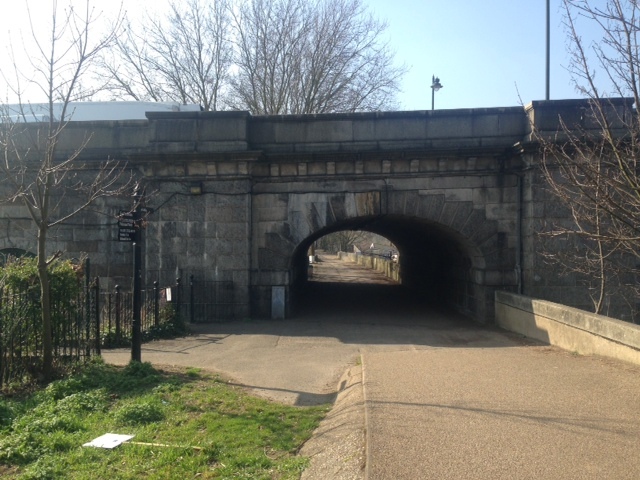 Exit Hammersmith Bridge Road to your left, go down the stairs and run under the bridge onto the Thames footpath. Now it’s time to enjoy the view as we run along the Thames for almost four miles—it’s beautiful! Run UNDER the bridge and then turn left, past a couple of tiny shops and garages. 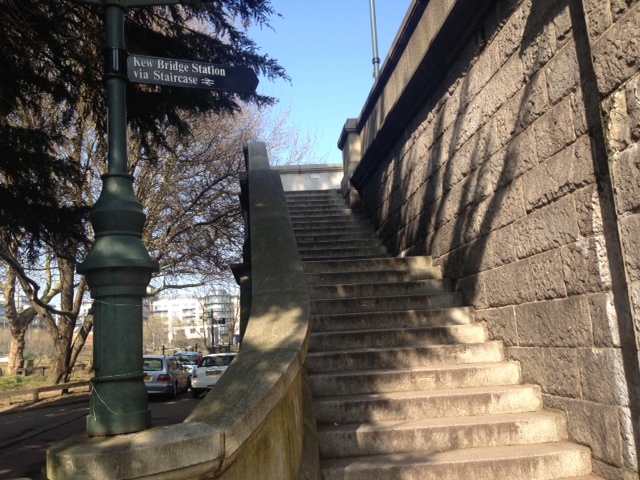 Run through the small parking lot until you see the stone steps leading to the top of the bridge. At the top of the steps turn right towards town (not back over the river) and run along this road [Kew Road] for about a third of a mile until you reach a 3-way intersection. 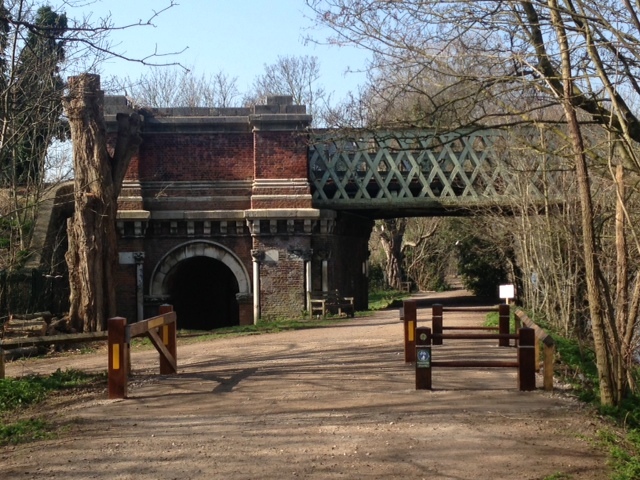 At the 3-way intersection, veer right and follow Kew Road along the boundary wall to Kew Gardens until you reach the first main pedestrian entrance to Kew Gardens, the Victoria Gate. Across from Victoria Gate, is Lichfield Road (it is only sign posted on the left-hand corner). Follow Lichfield Road straight into Kew village. Starbucks is on the left where we’ll all meet up to congratulate ourselves on such a great run! I hope you all had a great break for those of you who had break. We have just two more long runs before the race – it’s coming up fast! This week, we ease back into it a bit by doing 100 minutes. 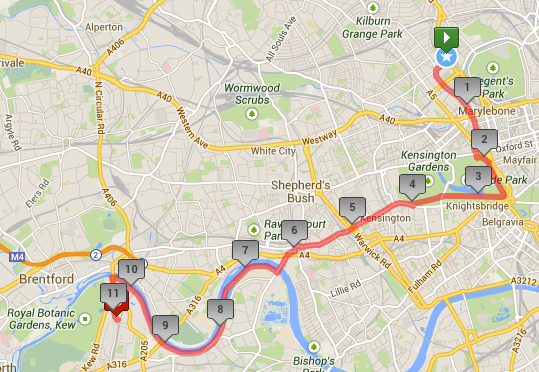 We will do the long Hyde Park loop, going behind Kensington Palace, and then returning to SJW. Mary H is going to meet us for coffee at Starbucks – we miss her! – so I hope you can stay for a bit after the run. As the race approaches, if you are going to the race, you will receive more detailed information from Jane about who is on which flight and any details about the itinerary for the weekend. In the meantime, please make sure you send me the information for the photo directory if you haven’t already. The deadline is this Friday. It’s really great for the MWF group to get to see who you are and vice versa! Also, don’t forget to go to one of the filming sessions this week at Chris Roberts’ house. I went yesterday and it was quite amusing. Even if you are not going to the race, please go to a session! The video is to celebrate all of our runners, not just those who are going to the race. The date that worked for most of us to go see Jodi preach is 8 May. As we get closer, we will coordinate heading over or meeting there. If you can’t go that day, she is also preaching this Sunday (10 April) as well as 5 June (her last time). Make sure you are doing lots and lots of stretching these last few weeks before the race. We don’t want any injuries! Here’s a map of the route for Thursday. See you then!